Clients are endlessly searching for the perfect diet that will help them lose weight, feel great, and improve their health, and they want you, their trainer, to help them find it. While trainers need to work within their scope of practice based on individual state regulations, these five guiding principles can help clients refine their food intake and reach their desired goals. Understand the various factors that determine a client’s nutritional needs. Identify principles that will help clients refine their nutritional intake. Explain the importance of overall diet variety, while limiting variety at any one meal. Understand the importance of eating locally and in season. What is the ideal diet? There are numerous books that will try to convince the reader that one diet is superior to another. Unfortunately, no one diet is right for every client. Nutritional needs depend on the client's age, activity level, health status, genetic makeup, goals, and many other factors. Additionally, as those variables change, so too should their intake. Thus, the perfect diet is one that is in constant flux and meets the current needs of the client. While it may be easier to follow a pre-programmed meal plan, that may not be ideal in the long run. Below are some guiding principles to help clients improve their nutritional intake. Whole, fresh foods are superior to foods that are processed. The nutrition content is higher and there are no added ingredients, preservatives or chemicals, especially if the food is organic. In the book The RA2D Triad: Transform Your Mind and Body, there is a Nutrition Continuum for foods (1). An example for fruits and vegetables is provided below. 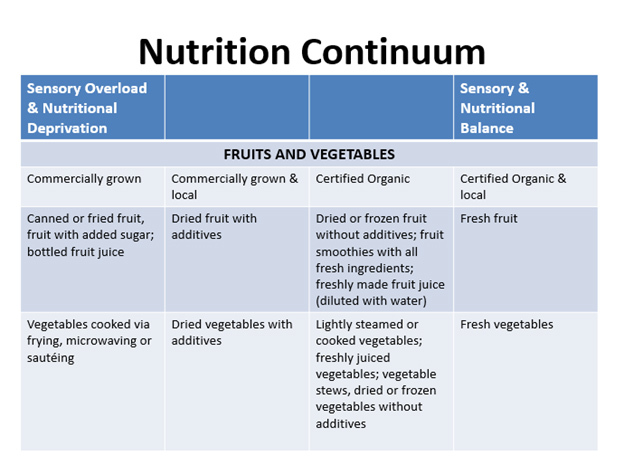 On the left side of the continuum are more processed foods that provide sensory overload and nutritional deprivation. These foods contain sugar, salt, preservatives, and other ingredients that do not provide much nutritional value but may stimulate overconsumption of them. As you move towards the right side of the continuum, there are foods that provide more sensory and nutritional balance and contain few, if any, added ingredients. Encourage clients to make more selections from the right side of the continuum, as these foods support health and weight loss goals. While fresh foods are a better choice, most clients will still want to consume some of their favorite foods, which are likely on the left side of the continuum. While these foods do not support optimal health or losing weight, making something off limits can make clients want it more. As the saying goes, we want what we can't have. In fact, telling a client that they cannot eat a particular food may actually have them consume it more than they otherwise would have. Instead of categorizing foods as bad, talk about whether foods will or won't help them reach their goals. Encourage consuming more foods that are in line with their goals and less foods that are not. Help clients establish how frequently to include less nutritious foods in their diet and appropriate portion sizes. This will allow clients to meet their goals while still enjoying an occasional treat. Encourage clients to rotate the foods they eat, so they are not consuming the same fruits, vegetables, proteins and fats every day. Many use a four-day rotation diet, in which the same foods are eaten only every four days. This allows clients to have some continuity and regularity with their meal planning while also keeping food choices varied. Eating foods in season also assists with variety, as described below. While variety within an overall nutrition plan is important, keeping meals simple may be better than having too many ingredients at a single setting. Some research has shown that people will consume more when there is a variety of food to choose from (4). In one study, participants consumed 23% more yogurt when offered three different flavors, rather than just one (5). Other studies, as discussed by Raynor, demonstrate that differences in the color and texture of foods increase the sensory variety of the meal (6). This sensory variety may drive your clients to eat more than if the meal is simpler and contains fewer foods. With the ability to get almost any food at any time of year, it makes it easy for clients to eat the same foods every day. Encourage clients to eat locally and purchase foods from a farmer’s market. Not only are they supporting their local farmers directly, but they are also buying foods that are in season and are picked at, or close to, their peak ripened state. Foods purchased from other countries are often picked in an unripe state and then chemically gassed to artificially ripen them. There is no such thing as a perfect diet. There is no one plan that will magically help clients meet all of their goals. However, implementing these five guiding principles can help your clients make better food choices and improve the quality of their overall diet. This gives them the freedom to choose foods they enjoy, adjust their food consumption to their bodies’ current needs, and reach their health and fitness goals. Include a variety of foods each week. Limit variety within each meal. Zmijewski, C. (2010). The R.A2.D. Triad: Transform Your Mind and Body. Northglenn, CO: Lulu, Inc. & Goddess Athlete. Bhupathiraju, S. N., & Tucker, K. L. (2010). Greater variety in fruit and vegetable intake is associated with lower inflammation in Puerto Rican adults–. The American journal of clinical nutrition, 93(1), 37-46. Ouwehand, A., Isolauri, E., & Salminen, S. (2002). The role of the intestinal microflora for the development of the immune system in early childhood. European Journal of Nutrition, 41(1), i32-i37. Rolls, B. J., Rowe, E. A., Rolls, E. T., Kingston, B., Megson, A., & Gunary, R. (1981). Variety in a meal enhances food intake in man. Physiology & behavior, 26(2), 215-221. Raynor, H. A. (2012). Can limiting dietary variety assist with reducing energy intake and weight loss?. Physiology & behavior, 106(3), 356-361.